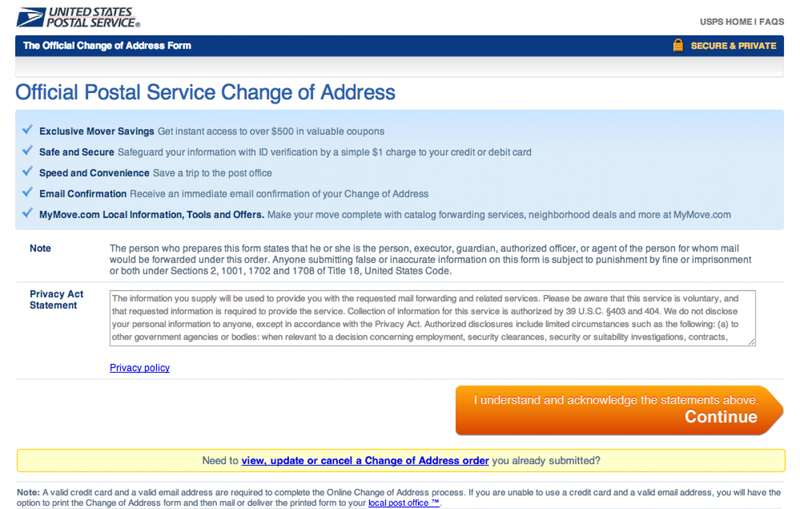 This is a guide showing you how to change your address with the United States Postal Service. https://moversguide.usps.com/icoa/home/icoa-main-flow.do?execution=e2s1&_flowId=icoa-main-flow& This link will get you to the first step of the USPS change of address form. From this page click the orange "Continue" button. You'll need to know whether this is a permanent move or a temporary move and when you'd like to start and stop the change of address. You'll also need to specify if this is a family, business, or individual move. After you've finished click the orange "continue" button. Here you'll fill out your name, your old address and your new address. The last step of the process requires you to pay $1.00 with a credit card in order to verify your information. After you click continue, your change of address is effective!